Part five of this IoT project details the equipment necessary to measure the temperature and control a fan with a Raspberry Pi 2, Azure Service Bus, and a Microsoft Band. This blog post will talk about the setup of the app itself, actually excluding most of the stuff related to the Band—and concentrate on how to setup a reasonably componentized app. This app also uses dependency injection, as discussed in my post about the app on the Raspberry PI2, but this one makes full use of the MVVM pattern—to be more specific, MVVMLight, by my fellow MVP (although I can barely stand in his shade) Laurent Bugnion. I make use of his ViewModelBase and Messenger, as well as SimpleIoC for some inversion of control, and DispatcherHelper to get help me solve potential issues with background processes having effects on the UI. 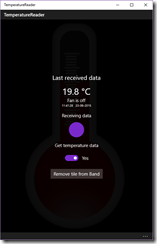 TemperatureListener listens to temperature data coming from the Raspberry PI2. It's a thin wrapper around TemperatureQueueClient (also explained in in the 2nd post of this series). An ErrorLogger, which I will describe in a future blog post. A MessageDisplayer—it's implementation being something that shows a toast, as already mentioned. A BandOperator—a class that handles all interactions with the Microsoft Band as far as this app is concerned. This will be handled in detail in the next blog post. Notice it takes a FanSwitchQueueClient as a parameter—the BandOperator itself will handle the posting of the fan switch command (and defer the actual execution to the FanSwitchQueueClient). Note that it puts the TemperatureQueueClient in Listen mode—this is again exactly the mirror image from what is happening on the Raspberry PI2. Start basically kicks the whole thing off. I have found out that unless you specifiy the Task.Delay(1), setting IsBusy does not have any effect on the UI. Once, and I am literally talking the previous century here, I used DoEvents() in Visual Basic (6, yes) that had exactly the same effect ;). Now you get to see the progress ring and the overlay on the rest of the UI. Both this ViewModel and the bandoperator are made to listen to incoming temperature events on the TemperatureListener, and that TemperatureListener is started then. The bandoperator can do with it whatever it wants. Then we start a 'background session' to keep the app alive as long as possible. Then the band operator is started—this will in effect create a tile and a user interface on the connected Band, if that is not already there, and the Band will be made to vibrate. The application is running now. If you hit the ToggleSwitch that is labeled "Get temperature data" you will notice Windows 10 mobile asks you to allow the app to track your location. This is in essence a trick to keep the app alive as long as possible—as I said before, the code to make the Band UI work runs on your phone but only does so to as long as the app is running ( and not suspended). I use ExtendedExecutionSession to trick your phone to think this app is tracking location in the background and should be kept alive as long as possible. I think using ExtendedExecutionSession was first described by my fellow MVP Morten Nielsen in this article. I also got some usage guidance on this from my friend Matteo Pagani. In this demo I am clearly misusing ExtendedExecutionSession, yet it kind of does the trick—the app is not suspended right away (as happens with a lot of normal apps) but is more or less kept alive, until the phone needs the CPU and/or memory and suspends it after all. So this trick only delays the inevitable, but for demo purposes it is good enough. A probably better way is described in this article by James Croft, which uses a DeviceUseTrigger. Upon resuming, I only need to restart BandOperator again (and a fake Geolocator for good measure). Quite a lot going on in this app, and then we haven't even seen what is going on with the Band. Yet, but using MVVMLight and neatly seperated components, you can easily wire together complex actions using simple patterns using interfaces and events. In the final episode of the series I will show you in detail how the Band interface is made and operated. In the mean time, have a look at the demo solution.